Within hours of an overdose from heroin in June of 2008, Chris Herren was released from a Fall River Hospital. Only partially through detoxification from the drugs and alcohol in his body, with no healthcare coverage and little money to his name, he was back out on the street overwhelmed by a sense of shame, with few options and no place to turn. Friends stepped in and with modest financial support and a strong hand helped Chris through an extended treatment program and a return to sober living. Drug-free and alcohol-free since August 1, 2008 Chris has refocused his life to put his sobriety and family above all else. He attends meetings to support his substance free lifestyle and often speaks before groups trying to overcome addiction to share his experiences and road to sobriety. Chris Herren’s story and his redemptive rise from the depths of addiction were captured through the publication of the book, Basketball Junkie and the release of the ESPN Films documentary, Unguarded. 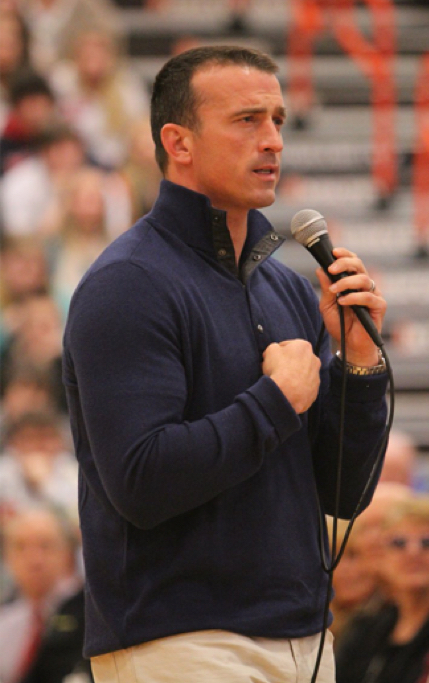 As a result, Chris Herren has received thousands of desperate “calls for help” from others facing addiction. The Herren Project was formed in 2011 to answer those calls, increase education and public awareness on the dangers of substance abuse and to assist one person, one family at a time through a combination of treatment navigation, educational initiatives, mentoring, and public awareness. Outreach efforts have moved individuals from all ages, walks of life and socio-economic conditions, out from behind the cloak of guilt, shame and denial, to the light of treatment. The Herren Project’s programs and initiatives are a direct response to the increasing number of young people across the United States that are experimenting, using and suffering from addiction to drugs and alcohol; or are at risk for such abuse. Together we can make a difference, celebrating life and supporting one another.